Promoter represents the outcome of more than 25 years of development, use and feedback making it a state of the art method for evaluating projects. Unlike other models, it is not a spreadsheet. It does all the things a spreadsheet model can do, and more. It is used on very large and complex projects as well as smaller projects which are suited to project financing. As projects include a greater number of stakeholders with differing requirements and interests, spreadsheet modelling has limitations which are met by stand alone executable software such as Promoter. 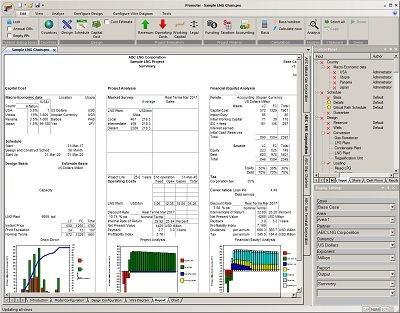 Promoter is the underlying technology used by a range of project finance software tools for evaluating and appraising projects in the oil, gas, petrochemical, power, pulp and paper, transportation, infrastructure and related industries. This project finance model can be used in traditional project finance cases as well as in infrastructure concessions with Public Private Partnerships (PPP) and in BOO (Build, Own, Operate), BOOT (Build, Own, Operate and Transfer) and related projects. It predicts the cash flows, including the equity and loan draw down during the construction phase; and the revenues, operating costs, loan repayments, tax payments and dividend streams during the operating phase. It is used to assess the viability of such projects by calculating the Internal Rate of Return (IRR), Net Present Value (NPV), payback, loan cover ratios and other key criteria. The Enterprise version includes database support and the ability to set up and analyse portfolios of projects. All versions of Promoter are available on premise or supplied as Software as a Service (SaaS) i.e from the cloud. Promoter is supplied by Project Planning and Management Ltd (PPM) as part of its consulting services. PPM are an independent group of consultants based in London. now is the time to think about the alternative.